Sterrett’s Caravan Park01600 890886work Holiday & Touring ParkSterrett’s Caravan Park is set in the beautiful Wye Valley at Symonds Yat West, Herefordshire and the Campsite is ideally situated for touring the many places of interest nearby. The River Wye is within 200 metres proximity to the campsite. Sterrett’s Caravan Park has been carefully developed over many years and has glorious views, a river frontage and is close to the market town of Ross-on-Wye. The Park is just one hour’s drive from Birmingham, Bristol and Cardiff. The Campsite is ideally situated for touring the many places of interest nearby or walking the country lanes to enjoy the panoramic views that surround the park. The River Wye is within 200 metres proximity to the campsite. 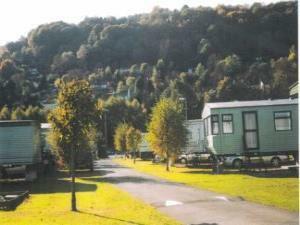 Sterrett’s Caravan Park has eighty-two static holiday caravans and eight touring pitches in this picturesque setting. With a resident warden on site, reception office, laundrette and telephone there is a children’s play area. All static vans are fully serviced and there are both grass or hardstanding pitches for tourers with showers, toilets and electric ‘hook-ups’.